Deguelin, an inhibitor of mitochondria in cells, can be used to target lethal prostate cancers lacking the gene PTEN. 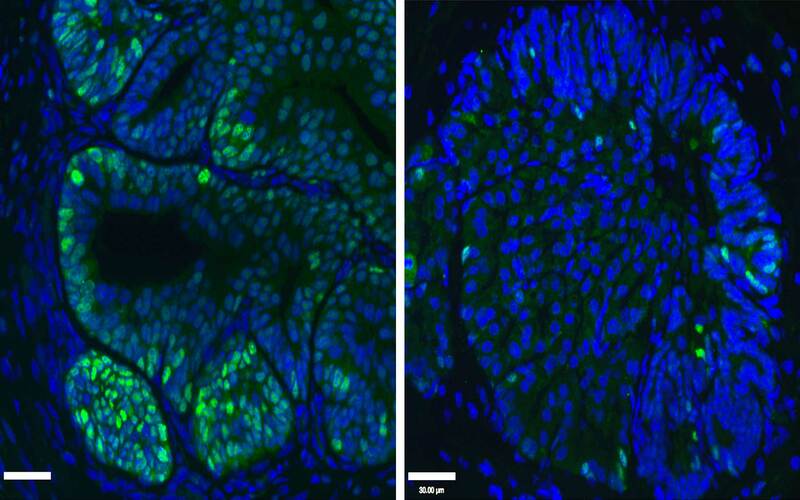 Left: cancerous mouse prostate cells glow green. Right: After 10 weeks of treatment with deguelin, only a few cancer cells remain. This compound and another called rotenone, kill cells missing PTEN but don't harm normal cells by exploiting cancer cells' dependency on glucose. In lethal prostate cancer, the gene PTEN is often missing. In such cases, one effective treatment may be to administer drugs that inhibit mitochondria. In tests in mice, two such inhibitors induced cancer cells to eat themselves to death. Cold Spring Harbor, NY — Scientists at Cold Spring Harbor Laboratory (CSHL) have discovered that cells lacking the tumor-suppressor protein PTEN—a feature of many cancers—are particularly vulnerable to drugs that impair their energy-producing mitochondria. Such drugs induce them to literally eat themselves to death, the research shows. Some mitochondrial inhibitors, including the widely prescribed diabetes medication metformin—one of the most widely taken drugs in the world—are already being evaluated in clinical trials for their ability to prevent or treat many types of cancer. The new findings, reported today in Cell Reports, suggest that such drugs have the potential to eliminate cancer cells at doses that leave healthy cells intact. The timing is critical, however. When glucose levels are high, this window of opportunity is completely lost. “The hope is that carefully timed administration of these drugs can generate a much better window of selective killing,” Trotman says. Left: nucleus (N) of a healthy cell, surrounded by networks of mitochondira, which form spaghetti-like strands just outside the nucleus. 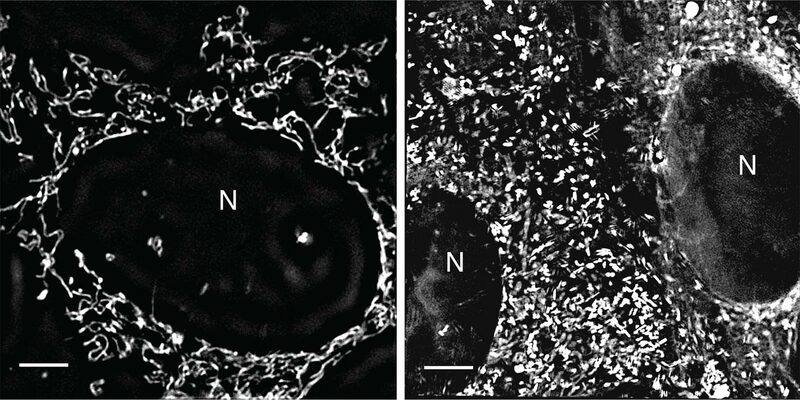 Right: After treatment with mitochondrial inhibitor deguelin, mitochondira have fragmented and are now separated in the space between two cellular nuclei. Administered when glucose is low, such inhibitors effectively induce cancer cells to eat themselves to death. Normal cells survive. The two drugs had little effect on nearly identical cells with functional PTEN. One, rotenone, is a known mitochondrial inhibitor. 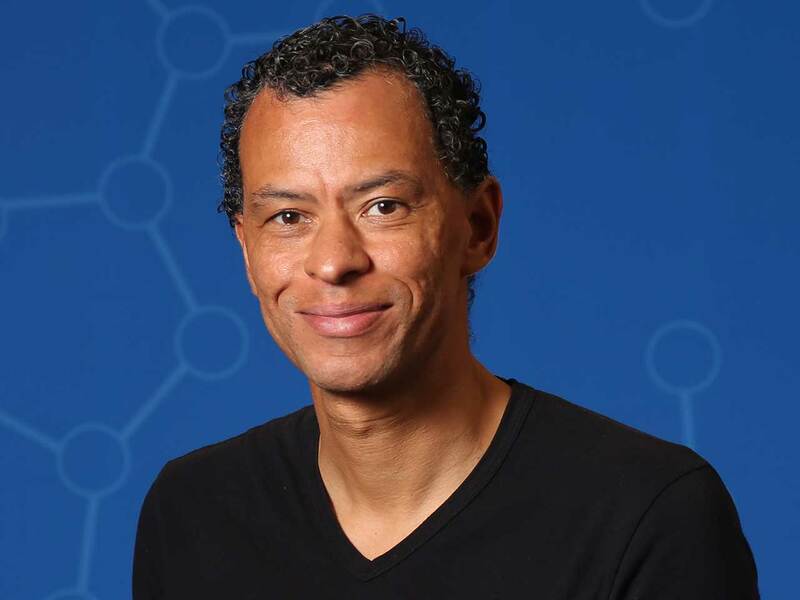 In collaboration with Navdeep Chandel at Northwestern University, Trotman’s lab established that the second compound, deguelin, works in much the same way. Oddly, further experiments with deguelin revealed that deguelin shuts down mitochondrial function just as well in cells with PTEN as it does in cells that lack it. This raised the question of why normal cells were able to tolerate the toxic compound. The answer has to do with how cells use glucose, say co-first authors of the paper, postdoctoral researchers Adam Naguib and Grinu Mathew. They found that cells without PTEN take in glucose from their environment to generate the energy-rich molecule ATP, which they import into mitochondria to keep them intact. “That’s the exact opposite of what mitochondria are supposed to be doing,” Professor Trotman points out. “Mitochondria are supposed to generate ATP for the rest of the cell.” For these cells lacking PTEN, unless there is an endless supply of glucose, they quickly use up the sugar and die. All cells need glucose, but cells with an unusual need for it, like cancer cells lacking PTEN, are especially vulnerable to its availability. This means it could be critical to administer mitochondrial inhibitors to cancer patients when their blood sugar is low, Trotman says. Since the protocol used to manage diabetes calls for metformin and similar drugs to be taken immediately after meals, when glucose levels are high, it would likely have to be revised if these particular compounds were to be used in prostate or other cancers in which glucose level is critical. American Cancer Society, Pershing Square Sohn Foundation, U.S. Department of Defense, National Institutes of Health, American Cancer Society, Robertson Research Fund of CSHL, CSHL Cancer Center Support Grant from the NIH. Naguib A. et al, “Mitochondrial complex I inhibitors expose a vulnerability for selective killing of Pten-null cells” appears online in Cell Reports April 3, 2018.